Regent Antiques has been trading in London for three decades. We specialise in English and Continental antique furniture, silver and porcelain. Our main markets are Europe and North America and we export worldwide. 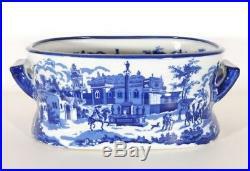 Delightful Blue & White Porcelain Planter Jardiniere. This is a delightful decorative blue and white ironstone china planter which will look fabulous with plants and flowers but is also ideal for keeping newspapers and magazines. It dates from the last quarter of the. With mark on the base that reads "Victoria Ware Ironstone". In excellent condition, please see photos for confirmation of condition. Height 14 x Width 34 x Depth 22. Height 5.5 x Width 13.4 x Depth 8.7. Take a tour of our London showrooms. Take Piccadilly line to Manor House station. Go to top of escalators and turn left. Take exit 7 and walk straight on for 10 metres. Manor Warehouse is on the right. There is car parking available on site. Please make all cheques payable to Regent Antiques. Bank details: Regent Antiques - BBVA - Account: 05701615 - Sort: 23-59-11. For the best value, we recommend offsetting this cost by purchasing multiple items. The item "Delightful Blue & White Porcelain Planter Jardiniere" is in sale since Wednesday, October 10, 2018. This item is in the category "Pottery, Porcelain & Glass\Porcelain/China\Other Porcelain/China". The seller is "regentantiquesuk" and is located in London N4 1BX.